Every day we spend some time in the toilet. It has a significant effect on our overall health. The toilet seat is an important matter we must not ignore. There are mainly two types of toilet seats – wooden toilet seat and plastic toilet seat based on the material they are made of. Generally, solid wood, medium density fiber wood, and bamboo are used to the made a wooden toilet seat. Toilet seat made from wood gives your bathroom a classy look. It has also other benefits of wooden toilet seat which will be discussed in the bottom portion of this article. Let me introduce you some branded toilet seat first that will help you to have a better experience in the toilet. Oakwood has a beautiful texture. Toilet seat made by oak gives a classy look in your bathroom. Natural oak finish toilet seat made by Aqua plumb is an elongated shaped toilet seat with attractive design. Since they have an elongated shape you can use them in any elongated toilet but not in the standard round shaped toilet. The beautiful wood grain of oak wood has introduced an extra dimension of aesthetic beauty in this wooden toilet seat. Those who are looking for toilet seats that are beautiful and able to add a classy look in their bathroom natural oak finish toilet seat can be a great option for them. It has metal hinges and plastic bumper. All of the hinges are coated with nickel. Mounting hardware is also included with this oak finished toilet seat. You do not need to use any oil or polyurethane on the outer surface of this toilet seat to retain its shine. It will remain shiny and attractive for a long time as it is delivered by the company. What you have to do, is keeping it clean. It is a long-lasting product; once you buy it, it will provide you service for a long time. It is not so pricey; you can easily afford it even with a narrow budget. Sanilo is a popular name in the market of the toilet seat. To make your bathroom a luxurious one Sanilo has designed their extravagant Sanilo Elongated Toilet Seat. It is made from molded wood and designed to fit for any elongated toilet bowl. The designers of Sanilo have designed their product to give you highest comfort during using it. It has strong and long lasting hinges. Its stable and smooth surface with spacers can take a great load. It is easy to install and does not require so much time for installation. Sanilo provides all installation material with their product. So you do not have to spend any extra penny to buy installation material. Toilet seat with fast closing mechanism makes a loud sound during closing that means the lid hits the toilet seat with great force which decreases the lifetime of the toilet seat. To prevent this problem, Sanilo Elongated Toilet Seat is manufactured with a slow closing mechanism. Its lid does not hit the toilet seat at a great force during closing and so it can provide you service for a long time. Sanilo is ranked as one of the top toilet accessory companies who gives the highest importance to the quality of their product and feedback of their customers. So you can shop from Sanilo without any worry. Mayfair is a brand of the USA who is renowned to manufacture nature –friendly products with innovative features and benefits. They never compromise with the quality of their product and give attention to every detail of the product. Mayfair has been introduced STA-TITE fastening system in their wooden toilet seat which keeps the seat stable on the bowl. Because of having STAS-TITE fastening system you can install them easily and quickly just using a wrench. Hinges of this product are made of plastic but don’t worry about their durability, because these plastic hinges are very strong and sturdy, so they have a long lifespan. You can also change these hinges easily if needed. They fit all round shaped toilet bowl such as – Kohler, American Standard, TOTO and many more. You can clean this toilet seat using any kind of cleaner except Clorox bleach. Because Clorox bleach can discolor the product temporarily. Mayfair Wooden Toilet Seat closes slowly and hence does not make any loud sound. There is zero possibility of slamming and pinched fingers. It is coated with glossy enamel that helps to resist any chipping or scratching. Its shiny and glossy black color gives you an elite looking bathroom. To express the elegance of your taste and choice within a short budget, wooden toilet seat of the Mayfair brand can be a great option. 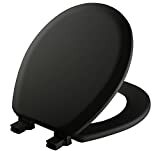 Benfa U-V-O Type Universal Toilet Seat is a great choice for any place including restaurant, office, hotels, and families. To express your refined taste and choice, the wooden finish Benfa U-V-O Type Universal Toilet Seat is a perfect choice. It is made from premium quality solid wood. Once you buy it for your toilet it will give you service for years after years. A toilet seat of artistic design, shine and gloss are obviously eye-catching. But during choosing or buying a toilet seat you must give importance to the ergonomics of the design. An attractive toilet seat without ergonomic design must be avoided. Designers of Benfa have made their U-V-O Type Universal Toilet Seat with ergonomic design. So, if you buy this product you do not have to suffer from any health issue that is related to the toilet seat. All the assembling materials are provided with the product. Two types of hinges made from steel are provided with the product – one type fits from above and other type fits from below the toilet pan. While installing it on your toilet bowl keep in mind that the installation process of the top and the bottom part is different. The slow closing mechanism is incorporated into this product. It perfectly fits in any OUV type toilets. Though it is quite pricey compared to another toilet seat its quality is better. So if you want a product of good quality you must have the mindset to spend a little more. Sanilo Round Wood Toilet seat is a premium quality toilet seat that fits perfectly to round shape toilet bowl of any manufacturer. Molded wood has been used to manufacture this toilet seat. Its ergonomic design gives you highest comfort and ensures your good health. Sanilo provides all of the installation material with their product and it does not take more than 5 minutes to install if you are not very unskilled. You can adjust it to a certain range of length. The good quality wood and strong hinges with slow closing mechanism have made Sanilo Round Wood Toilet seat a long lasting product. Its golden color gives a gorgeous look to your bathroom. Its excellent workmanship featuring smooth surface gives you the convenience of easy cleaning within a short time. Sanilo has a good reputation for its customer service. If you face any problem with your product, do not feel hesitate to contact with Sanilo. They will help as soon as possible. It is available at a reasonable price. Sanilo is among those few products that provide so many features at a low price. If you choose Sanilo for your toilet, I can ensure that you do not have to regret afterward. Deluxe Harvest Gold Wood Round Toilet Seat is made of Harvest Gold colored molded wood. It is a toilet seat of attractive aesthetic beauty that gives your toilet aristocratic look. The surface of the toilet seat is covered with multiple layers of long-lasting durable coating to beautify the molded wood. It has good resistance to corrosion. The cover and seat are perfectly aligned. You can install it within 5-7 minutes using a screwdriver. You clean it easily and you do not have to use any special cleaner for this purpose. Warm soapy water is enough to clean this deluxe toilet seat. HowPlumb – the manufacturer of Deluxe Harvest Gold Wood Round Toilet Seat provides self-aligning hardware with their product. The composition of its raw material is fixed in such a way so that the product lasts for a long time. Howplumb provides this product at a reasonable price. So you can afford it without thinking twice about your budget. Deluxe Regency Toilet Seat is another product of HowPlumb made of molded wood. It is designed to fit any elongated toilet bowl. The molded wood seat is painted with mind soothing regency blue color. The deep lustrous of this product adds extra beauty to your bathroom. The rock hard enamel protects the glaze from fading and keeps the product glossy for a long time. Like other HowPlumb product, you can also install it easily with the aid of a simple screwdriver. The screws of this toilet seat show good resistance against corrosion. HowPlumb provides self-aligning hardware with the product. Deluxe Regency Toilet Seat is not very expensive and once you buy it you can use it for a long time. So it is obviously a good decision to choose Deluxe Regency Toilet Seat for your toilet bowl. 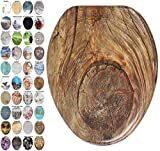 Why Wooden Toilet Seat Used For? As I said earlier that toilet seats are made of mainly wood and plastic. Since there is variation there is confusion. And to eradicate confusion by providing necessary information here we are. During winter the plastic toilet seat becomes very cold but wooden toilet seat does not. Wood is environment-friendly, but plastic is synthetic material. The wooden toilet seat can bear high load compared to that of the plastic toilet seat. The wooden toilet seat is cheaper compared to the plastic toilet seat. Wooden toilet seat gives a traditional and classy look to your bathroom at a time. Because of these above-mentioned advantages of the wooden toilet seat, you can choose a wooden toilet seat for your bathroom without any hesitation. Q. What kind of cleaner can I use to clean my wooden toilet seat? 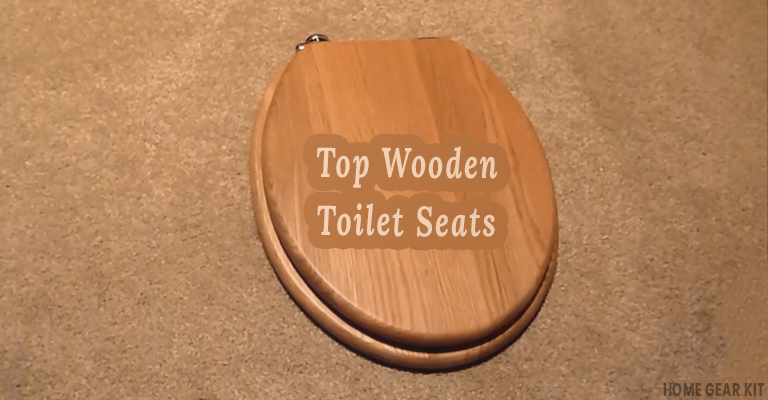 Wooden toilet seat does not require any special type of cleaner. You can use dish-washing liquid, hand-soap, antibacterial soap, hydrogen peroxide or rubbing alcohol to clean your wooden toilet seat. But some wooden toilet seat forbids some specific type of cleaner. So, after buying the seat check it properly whether there is any restriction about the specific cleaner. Q. Can I use an abrasive cloth to wipe down my wooden toilet seat? No, the abrasive cloth can make a scratch on your wooden toilet seat. You should use non-abrasive cloth or sponge to wipe down your wooden toilet seat. Q. How can I remove the odor of urine from a wooden toilet seat? You can remove the odor of urine from a wooden toilet seat by cleaning it with a paste of vinegar and baking soda. The wooden toilet seat is easy to maintain, comfortable to use, can be installed easily, natural product and so environmentally friendly. To give your washroom a warmer feeling wood is unbeatable. The above mentioned top 7 wooden toilet seat is trendy and branded product of the market. The list is made keeping the need of all kind of customer in mind. So, I hope you will find at least one product that meets your need perfectly.